Front loading 4C horizontal mailboxes offer a highly flexible alternative to office buildings, commercial complexes and multi-tenant apartment dwellings that require Commercial Mailboxes serviced by USPS. They are also ideal for use as USPS serviced Apartment Mailboxes. 4C commercial mailboxes feature pry-resistant master loading doors with one piece extruded hinges for the best in theft prevention. 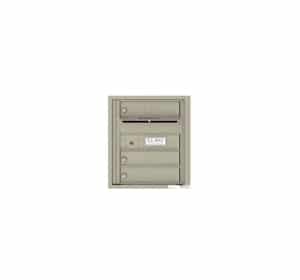 These front loading 4C horizontal mailboxes by Florence Manufacturing are USPS approved. They are extremely versatile 4C mailbox suites with highly flexible height options for tenant mailbox doors and parcel doors. 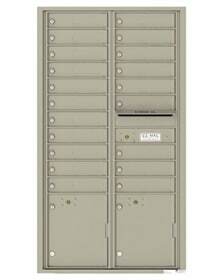 The 4C commercial mailbox door heights can be customized from single door height up to 5 high. The same is true for 4C outgoing mail collection compartments. 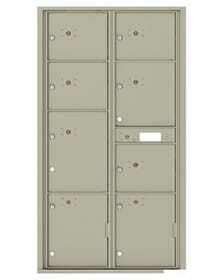 The number of doors stacked high determines the overall height of the Auth Florence 4C front loading mailboxes. 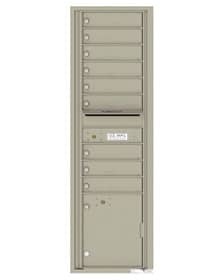 Select your 4C commercial mailbox center from over 80 standard pre-configured layouts. Because of the modular design, you can customize the mailbox layout to create endless options to properly meet your tenant needs. Choose from standard single (3.25″ high) tenant and outgoing mail door sizes up to 5 high (17.25″) doors. Don’t forget to ask our commercial mailbox representatives about customized “door slot” options (not USPS approved) for 4C commercial mailboxes that allow for the collection of checks, videos, books and other items. Complete our Expert 4C Mailbox Layout Design form and we will help you design your mailbox door layout with ease! Since 1989, MailboxWorks Mailboxes has been helping customers throughout North America find the most affordable and effective commercial mailbox solutions for apartments, multi-tenant buildings, office buildings, industrial complexes and more.